I thought this was appropriate since TODAY IS MY BIRTHDAY and all. My PayPal address is midgetmanofsteel@yahoo.com if you want to send me a great big cash gift. A couple of cool things happened last week. If you watch the show, "MasterChef" in the United States then you know that the judges panel is made up of Gordon Ramsey, Graham Elliot and some guy named Joe who is just generally mean to people and bites his fork. "This dish was eaten by Oprah Winfrey." "This dish was ordered by Jay-Z." "THIS dish..was eaten by President Barack Obama." Yes. 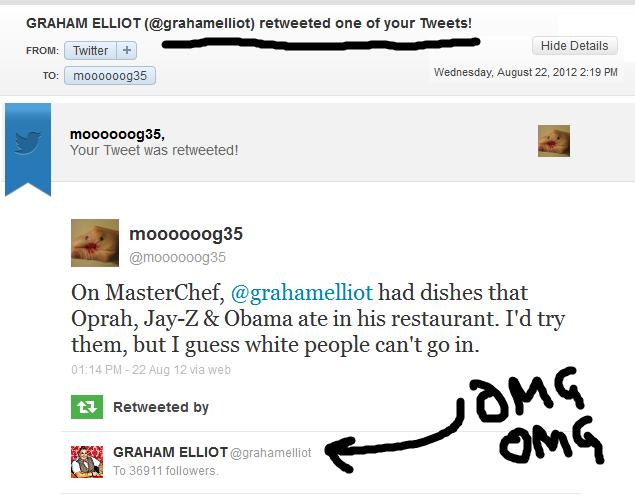 Graham Elliot retweeted it to his 39k followers and then I died. It looked even better on the big screen, people. True story. Now if someone would just pay me to do this stuff full-time, I'd be all set. Besides my employer, I mean. I should probably do some work. Love your posts. Happy Birthday, mine too today. I always knew we had something in common. Well, look at you! I am SHOCKED that Oprah hasn't tweeted you. That's funny; I watched that episode of Master Chef and it didn't even occur to me how racist Graham was. Thanks for calling it to my attention. Saves me the embarrassment of being turned away at the door. Happy birthday. I'd send cash but I haven't even bought my son a birthday gift yet and his birthday was in June. I'll buy YOU a gift if you'll take my birthday paddling! FORTY swats, uh, um, I mean 28! Also, my 4 year old DAUGHTER insisted on a Superman lunchbox for preschool. The side of it says "Man of Steel." And yet I think of YOU every morning. You're hittin' the big time. Please remember us little deviants at rock bottom on your way to the top. I'd Paypal you money, but is it possible for Paypal to bounce a deposit? Probably. happy birthday, old man. hope you're getting fingered and spanked right now. Except yours, mommakiss. The finger thing was just weird. Hot, but weird. And yes, Mad Woman, I would GLADLY take your spankings. 40 is 4 less than the ones I'LL be getting. Very cool about the Graham Elliot retweet. Great line. I saw that episode when they had to recreate his dish! I love when stuff like that happens. It makes me think that maybe my mom was right... I am funny. That and it's nice to know that people have a sense of humor. 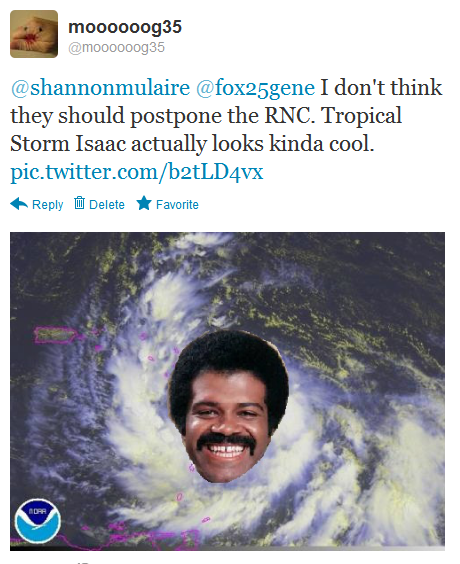 And by 'sense of humor' I mean the same warped sense of awesomeness we seem to share. Priceless! Happy Birthday! From now on I shall say "I knew him when..."
LOL Oh my gosh! How COOL!!! !